H.H. Sheikh Ahmed bin Saeed Al Maktoum, Chairman, Dubai Aviation City Corporation, President of Dubai Civil Aviation Authority (DCAA), Chairman and Chief Executive at Emirates Airline and Group, Chairman Dubai Airports, H.E. 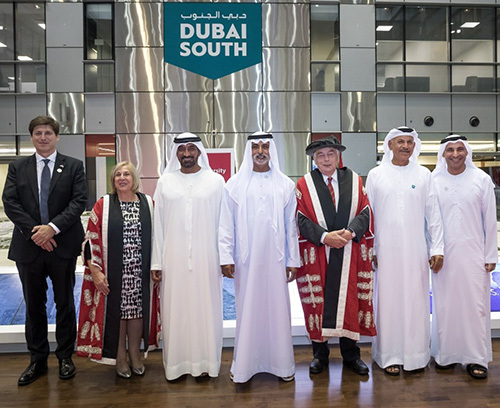 Sheikh Nahyan bin Mubarak Al Nahyan, Minister of Tolerance, and University of South Wales (USW) Vice-Chancellor Professor Julie Lydon OBE, officially opened the USW new aerospace academy in Dubai South. During the event, H.E. Sheikh Nahyan bin Mubarak Al Nahyan was officially recognized as USW’s International Patron, with Honorary Doctorates conferred on both him and H.H. Sheikh Ahmed bin Saeed Al Maktoum by the University’s Pro Chancellor, Professor John Andrews CBE. The specialist aerospace engineering facility will initially offer KHDA-approved programs including: BSc (Hons) Aircraft Maintenance Engineering with integrated European Aviation Safety Agency/ General Civil Aviation Authority (EASA/GCAA) Simplify to Tech training; BSc (Hons) Aircraft Maintenance Engineering top-up degree and Foundation course, through which a student can gain the right qualifications to move onto the degree program. The purpose-built 3,000 square meter facility at the Dubai South Business Park has state of the art learning and teaching space over two storeys, including an EASA/GCAA accredited workshop with an aircraft and CFM56-3 jet engine, mechanical principles laboratories and soundproofed maintenance areas. Dedicated laboratory space for electronic practical tasks and avionics systems are also a key feature that will provide hands-on practical experience for students, and composite-based equipment to produce sample materials. The tooling has been provided through a strategic partnership with Snap-on Tools Industrial. The launch is the culmination of a two-year project, which followed the signing of a Memorandum of Co-operation (MoC) with Dubai Aviation City Corporation (DACC), the parent organization of Dubai South, in May 2016. “Dubai South's journey to become the world's major aviation hub is well underway. Our recognition as a leader in the field of aircraft maintenance engineering education meant that we were a natural choice to be at the centre of the on-site education development, and we're pleased to have been selected to establish this partnership with Dubai South,” said Professor Lydon. “Having worked with some of the major players in the aviation industry, we have developed sector-leading skills with an international reputation. Being involved with Dubai South as it develops into a major hub on the global stage will mean that USW will be in the right place to do business with the main operators in the aviation arena. As the city expands, USW will also be able to build on strong relationships so that other courses developed in South Wales can be made available to global organizations operating at Dubai South,” Lydon added. “This new development is set to open doors for the next generation of aviation experts in the UAE by being strategically located right at the doorstep of the world’s largest airport, it provides students with a combined experience of academic rigor and hands-on training in an ideal setting at Dubai South,” he added. Dubai South is a planned city of a million people located next to Al Maktoum International Airport, set to become the world's largest airport, handling an estimated 220 million passengers and 16 million tons of cargo each year, close to Jebel Ali Seaport and adjacent to the Dubai South Logistics District. Dubai South’s 6.7sq km Aviation District is the permanent home of the Dubai Air show and the Middle East Business Aviation Show.